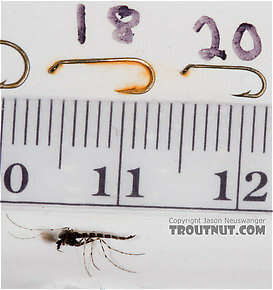 Some midges are large, up to hook size 14, but the majority are size 22 or smaller. The number of genera and species is hopelessly huge for angler entomologists to ever learn, and the identifing characteristics often require slide-mounting tiny parts under high-powered microscopes. Even the most Latin-minded fisherman must slip back to the basics--size and color--to describe his local midge hatches. Midge pupae account for much of the mystifying midsummer spring creek action on evenings when no bugs seem to be in the air or on the water, yet trout are rising everywhere and ignoring one's flies. Recognizing a midge hatch is far from a guarantee of fish, however. Suitable imitation is not easy. Anglers in on very fertile rivers, especially lakes and western tailwater rivers, often do well by imitating midge larvae. Despite the tiny size of midges, trout can be very selective to their size and color. 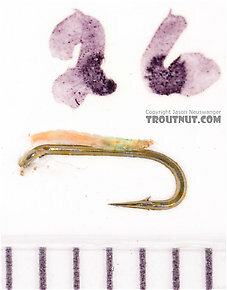 Remember that a difference of a single hook size in the tiny sizes is a very large percentage difference and very noticeable by the trout. Netting some of the real insects before choosing a fly is surely a good idea, but it's easier said than done. 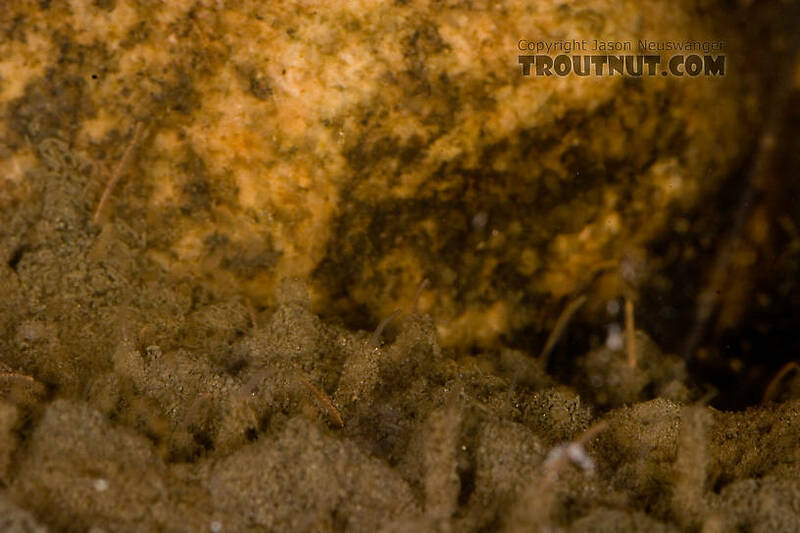 This isn't really an underwater picture, but a picture taken into my aquarium of midge larvae which lived in the silt I used for substrate. 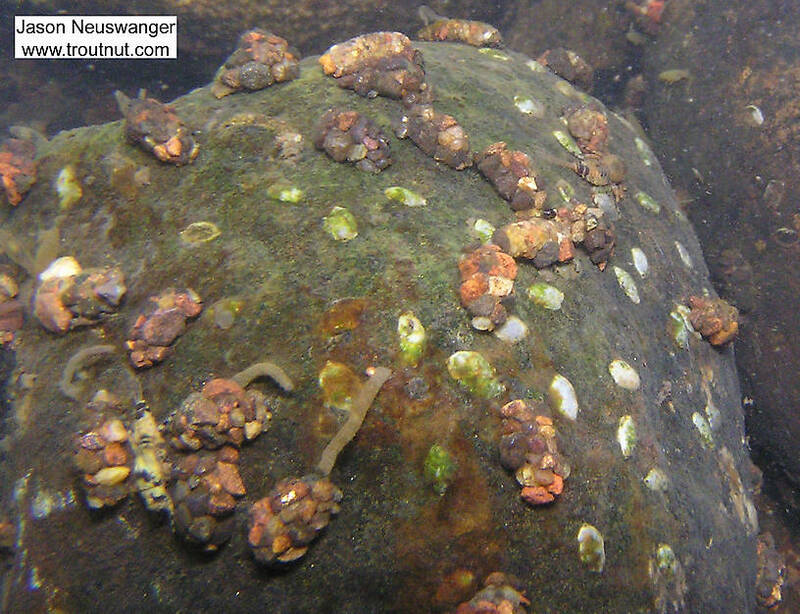 Each larva has a little tower of detritus (Detritus: Small, loose pieces of decaying organic matter underwater.) 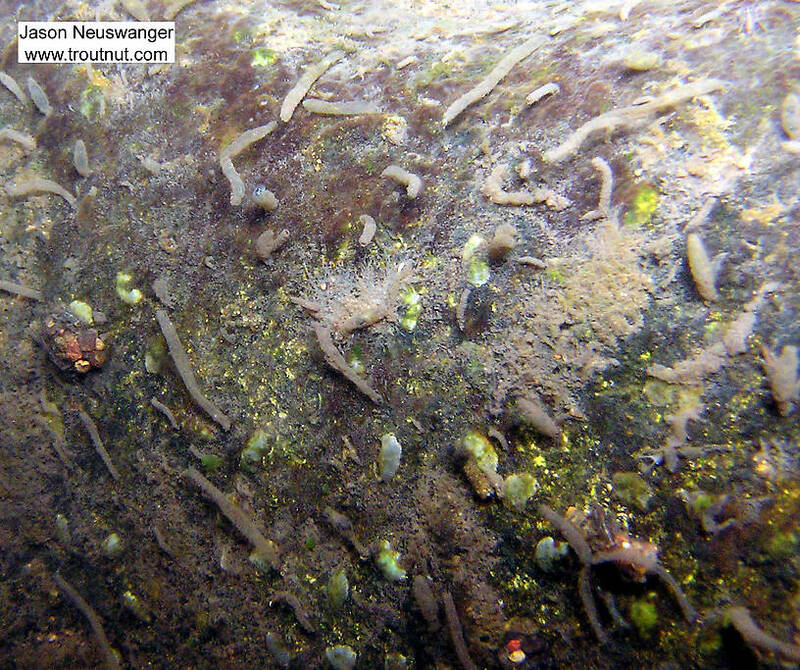 built up along the bottom, while the bare larva waves around from the top. says here midge pupae rise in the water and struggle in the film to become adults. my imitations are so small that they don't seem to go down very far in order to rise--ike a wet fly might at the end of the swing. any ideas? or am i fishing them wrong? This is a spin-off from a tangent in another topic which seems worthy of its own thread. Those are the explanations I've heard, too, but I'm skeptical of both. I'm not doubting the effectiveness of the Griffith's Gnat; I just think people have traditionally stretched the bounds of credibility when trying to explain a fly's success in imitative terms, and this is one of the more prominent examples. Has anybody here seen a cluster of midges on the water? I haven't. I have seen midges thickly grouped on rocks next to the water, and I don't doubt that they occasionally fall off of there, and probably sometimes two are three are clinging to each other. I've also seen early-season stoneflies balled up with each other in an opaque little (presumably mating-related) clump on a midstream boulder, and I wouldn't be surprised if some midge species do something like that too. But trout don't see balls of midges floating around very often on any stream I've ever observed. Has anyone experienced that? In either case, I can't see something so opaque as a Griffith's Gnat effectively imitating what would surely be a loose ball of gangly entangled midges. You would have to roll them around in your fingers for a while to goo them together so solidly. I just can't see the herl and hackle imitating, or even suggesting, a loosening pupal shuck. Shucks don't get that loose. They trail behind length-wise; they don't balloon to the sides. And they aren't pointy. Of course I'm sure Schwiebert knows all that and was just trying to add an idea to the mix of explanations, but I do find that one as far-fetched as the others. Here's another far-fetched guess: maybe the hackle and refractive trickery in the surface film reduce the perceived thickness of the fly and it passes for a single midge pretty well. This could be tested in an aquarium but it's late and I'm feeling lazy. I think it's more likely that when trout take a Griffith's Gnat they're only looking for (at most) the right general size and color. It's not as fun, but sometimes things are really that simple. I am trying to identify the life cycle of a few aquatic insects in eastern British Columbia. Specifically, I want to know if the species I collected in the fall (Aug-Oct) are a different hatch from the species I collected in the spring (April-May). Does anybody know when the following species lay eggs, die, and hatch: amphipods (Hyalella aztecha), chironomids, leeches, mayflies (Leptophlebiidae paraleptophlebia, Baetida sp. ), and caddis flies (Oxyethira sp., Hydropsychidae arctopsyche)? For my purposes, knowing the general life cycle of amphipods and chironomids would be great. I thing some members will like this video on midges. There are 4 more topics.